The goggles feature side vent caps to prevent fluids from entering, and a polycarbonate lens that meets ANSI Z87.1. They are also comfortable, being made from soft vinyl and a wide, adjustable head band. 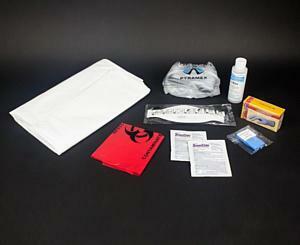 The whole kit is packed in a sealed, tamper-proof A4 sized bag for easy storage & distribution.